Made of 1000 denier black Cordura, the S&S backpack is built strong and durable. Take this bag with you when you travel through an airline, as it is below the standards for oversized baggage. It can be carried as a backpack or as luggage. Not just for coupled bikes anymore! I wanted something to haul a bike around with when I am traveling. I wasn't sure it would fit a 29er but it does. A downside is that you have to essentially disassemble the entire bike, which for me wasn't a problem but could be a deal breaker for some. It fits perfectly, even with foam to help protect the parts. It also is under the size requiring additional baggage fees so after a few trips, it should pay for itself. It can be a little daunting to carry it a long distance, mine weighed 43 lbs. Traveling to DC my packed bike arrived no problems and with no signs of damage. I would imagine that any fully suspended 26er and many 29er would fit in this bag, albeit with extensive disassembly. 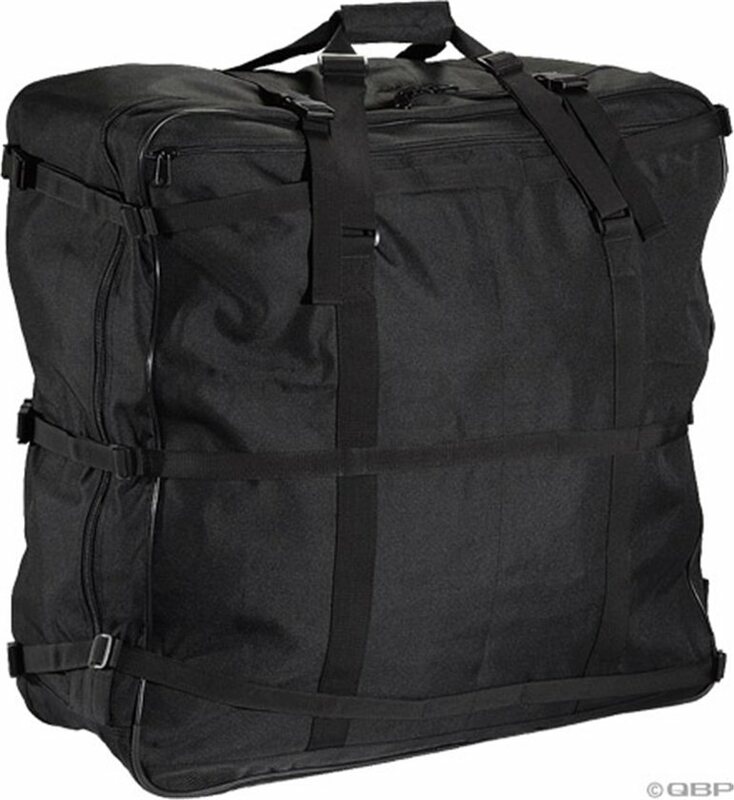 It is the only bike travel case I know that is exactly on the airlines' maximum linear dimension limit of 62" for suitcases, not one or two inches over. Also, it does not have a telltale plastic bulge in the side for the cassette. Cardboard (which is readily available when travelling) adds greatly to the case's structural integrity and protection for the bike. Use it for my 26er Dahon folding hardtail that uses the Ritchey breakaway system. Works great and paid for itself in saved oversized baggage fees in just two flights. Delivery can't be faster. US to Switzerland in 5 days? Weekend included! Hi! Where are the cases made? Must the handle bars come off to fit in case? BEST ANSWER: Depending on where your bars hit your frame, you may not need to remove the bars. Most likely you will have to loosen the stem to turn the bars if you don't remove them. I'm pretty sure S&S has a packing description. Yes. Apparently it's forbidden for me to put links in my answer, but if you Google sandsmachine and follow the "Packing" link on the S&S website you'll see how it's done. Yes, the handlebar needs to be removed. I have downtube shifters to reduce cabling and that really helps. See the S&S (sandsmachine) website for packing guide.